Update, 4:50 a.m. EDT: Good news! Our editor in chief, Carolyn Spencer Brown, is currently onboard Norwegian Epic and tells us that there is a good chance the ship will arrive in Southampton at 2:30 p.m. BST -- three hours earlier than predicted yesterday. Embarkation is expected to begin at 6 p.m. for the two-night cruise. We'll keep you posted. Check out our U.K. blog for more. 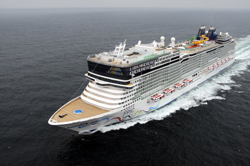 (June 21) -- The much-anticipated arrival of NCL's Norwegian Epic into Southampton tomorrow morning has been delayed due to a technical problem on the ship, the cruise line has confirmed. Norwegian Epic is due to leave Rotterdam this afternoon for a one-night preview cruise and had been set to arrive in Southampton at 10 a.m. BST tomorrow -- ready to welcome 2,500 media and travel professionals. The ship will still set sail today, at a reduced speed, and will dock in Southampton more than seven hours late -- at 5:30 p.m. BST tomorrow. The problems, NCL confirmed, are due to technical difficulties with the propeller shaft. In a statement, NCL has said that passengers on tonight's one-night preview cruise from Rotterdam to Southampton are being given the option to not sail and receive a full refund of the cruise fare paid and a future cruise credit for the value of the cruise fare paid. For those who decide to sail, NCL is covering up to 100 Euros per person for re-arranged travel fees. At this point, NCL says that embarkation for its two-night cruise from Southampton will begin at around 8:30 p.m. BST tomorrow. NCL spokesperson Courtney Recht tells Cruise Critic that repairs to the malfunctioning propeller shaft will be made once the ship arrives in Southampton tomorrow. The ship's inaugural cruise, a seven-night transatlantic departing from Southampton on June 24 and arriving in New York City on July 1, remains on schedule. Cruise Critic's editor in chief, Carolyn Spencer Brown, is already on Epic. Keep up-to-date with her on our U.K. blog. We'll keep you posted as the situation develops. Fan Cruise Critic on Facebook! Follow Cruise Critic on Twitter!